In the tenth century of the Common Era, in the city of Cordoba in the Andalusia region of Moorish Spain, lived the Muslim physician Abu al-Qasim al-Zahrawi, known to the Latin West as Albucasis. Albucasis was born in 936 and died in 1013 CE, and is generally recognized as being the leading Muslim surgeon of the Middle Ages, and the Father of Modern Surgery. Although advances in surgery are what Albucasis is most known for, and the invention of many different surgical instruments is attributed to him, his skill and expertise in the art of medicine didn’t stop there. Albucasis was the first physician to describe an ectopic pregnancy, which was a fatal condition in his day, and he correctly identified the hereditary nature of hemophilia. But out of all the books in the Al-Tasrif, it was book 30, on surgery and surgical instruments, that attracted the most attention by far. In it, Albucasis illustrates and describes some 200 different surgical instruments. Albucasis’ treatise on surgery and surgical instruments consists of some 300 pages, which can be roughly divided into the following subjects: cauterization (a specialty of his) – 56 sections; general surgery – 97 sections; orthopedics – 35 sections. Above all, Albucasis’ treatise on surgery was a full and complete exposition of all aspects of surgery as it existed in his day, which included discussions of dentistry, surgical dermatology, ophthalmology, diseases of the ears, nose and throat; surgery of the head and neck, general surgery, obstetrics and gynecology, urology, and military medicine or traumatology. For some five centuries after its initial translation, Al-Tasrif remained an important authority and reference work on medicine and surgery for European surgeons and physicians, since it solved many clinical problems. It contains the distillation of some 50 years of Albucasis’ own personal experience in training, teaching and medical practice. The great clarity and lucidity of its teaching and presentation guaranteed Al-Tasrif a prominent place in European medical literature for centuries, and awakened in European scholars and physicians a preference for Arabic medical literature. Writing in the fifteenth century, Pietro Argallata described Albucasis as “without doubt the chief of all surgeons.” The street in Cordoba where he lived is named “Calle Albucasis” in his honor. In so many aspects of surgery, Albucasis was a man who was way ahead of his time, and many surgical techniques and innovations that are usually attributed to later surgeons were actually first performed and described by him in the Al-Tasrif. He describes the “Kocher Method” for relocating a dislocated shoulder years before Kocher was born. Similarly, he described the Walcher position in obstetrics long before Walcher, and the ligaturing of blood vessels almost 600 years before Ambroise Paré ligated his own temporal artery for the migraine headaches he suffered from. And so, Albucasis anticipated a surgical technique for treating migraines that is enjoying a revival in the 21st century, thanks to the efforts of Elliot Shevel, a South African surgeon. Albucasis was also a leading pioneer in the field of plastic surgery, and performed many plastic surgery procedures. In the eleventh chapter of his treatise on surgery, Albucasis lays down many foundational principles in the field that are still used by plastic surgeons to this very day. For example, he was the first to use ink before an operation to mark the places where incisions would be made, which is still followed as standard procedure by plastic surgeons today. He described techniques of reduction mammoplasty for excessively large breasts, as well as operations for treating gynecomastia in men, which are still in use today. Albucasis had a special interest in eyelid surgery, and had a large assortment of fine surgical tools for treating just about every kind of eyelid disorder. The sheer variety of surgical operations described in the last volume of Al-Tasrif is simply amazing. Among these are tonsillectomies and tracheotomies, using a hook to extract nasal polyps, extracting bladder stones with a metallic syringe and speculum, the extraction of cataracts from the eyes, techniques for removing thyroid cysts, and operations to remove breast tumors. Above all, volume 30, as the largest treatise in Al-Tasrif, was a comprehensive surgical manual that covered all aspects of surgery: venesection or bloodletting, midwifery and obstetrics, wound treatment and traumatology, arrow extraction, and the setting of bones in both simple and compound fractures. He even wrote extensively on injuries to the bones and joints, including fractures to the nasal bones or vertebrae. He also discussed the use of caustics and antiseptics in surgery, as well as the use of suture materials – not only the customary and well-known catgut, but also the use of silk, wool and other substances. In the field of pharmacology, Albucasis pioneered the preparation of drugs by sublimation and distillation. In his Liber Servitoris, (Book 28 of Al-Tasrif), Albucasis provides the reader with many recipes for medicines that were in use in his day, and discusses the initial preparation of single herbs, or herbal simples, for use in the complex polypharmacy preparations of his day. In his surgical operations, Albucasis employed anesthesia, in the form of volatile aromatic preparations of narcotic and soporific drugs, which were held over the face of patients at the commencement of surgery to “put them under”. In Greco-Roman antiquity, the great master of surgery was Galen. But most experts on surgery agree that Galen’s skill and accomplishments in the field were greatly surpassed by those of Albucasis. So great were Albucasis’ achievements as a surgeon that the French surgeon Guy de Chauliac, writing in his treatise, Great Surgery , which was completed in 1363, quotes Albucasis’ Al-Tasrif over two hundred times. 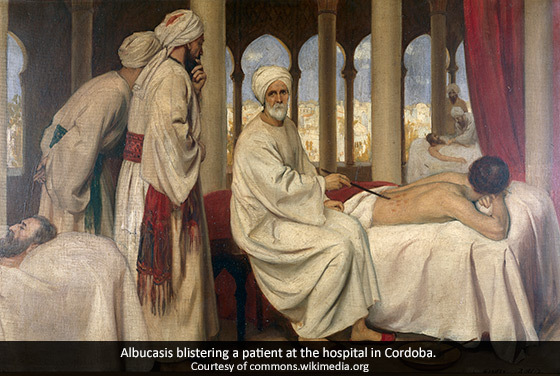 The great master of surgery in medieval Islamic Medicine was, without a doubt, Albucasis.